Do you solve all your problems by threatening to kill just about everyone you meet? Then, by gar, you might just click with “The Man” in Sunrise! First he’s ready to off his wife so he can run off with a floozy from the big city, then The Man lets that hair-trigger temper loose at the slightest hint of controversy. He even tries to kill the floozy! He would’ve made a great opponent for Mike Tyson. They could’ve hosted a horrible reality show together. But this movie isn’t famous for its near-violence. It’s highly regarded for the style, the in-camera effects, the visual storytelling and the remarkable cinematography (by Charles Rosher and Karl Struss). German director F.W. 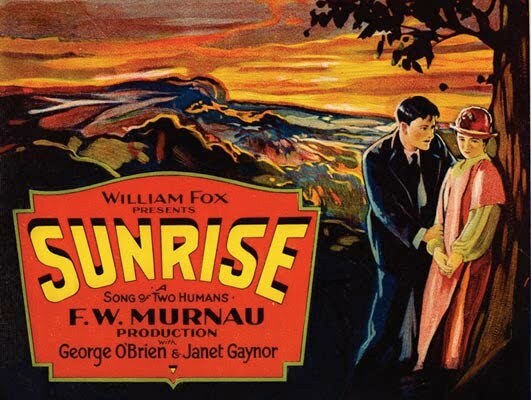 Murnau (who also helmed Nosferatu) came to Hollywood and made what many have called the greatest silent film ever made. From an artistic standpoint, they (good ol’ “they”) have a point. The story, however, is too simplistic and the over-the-top acting might make you laugh. Nevertheless, the American Film Institute added it to their 2nd Top 100 list in 2007 after ignoring it in 1998. Did 10 years make it better? Well, no. A better print on DVD than anyone had previously seen on videotape didn’t hurt. Your eyes will obviously enjoy looking at this picture. Your brain might not feel as stimulated as your orbs will. If you don’t think that’s true, it’s probably best that you just take me out a la The Man in Sunrise. Violence solves everything! It might even get your woman to come back to you.